United States Special Operations Command (SOCOM) is the Unified Combatant Command responsible for training, doctrine, and equipping all special operations forces of the Army, Air Force, Marine Corps and Navy. SOCOM has been granted acquisition authority by Congress to procure special operations forces-peculiar equipment and services. There is a perception among some observers and officials that SOCOM possesses unique acquisition authorities that allow it to operate faster and more efficiently than the military departments. SOCOM possesses unique acquisition authorities when compared with other combatant commands. However, SOCOM is generally held to the same statutory and regulatory acquisition requirements as the military departments and, in some instances, has less acquisition authority. There are no unique authorities granting SOCOM exemptions or waivers from acquisition requirements. But when it comes to acquisition, SOCOM is different than the military services. These factors allow SOCOM to maintain the majority of its procurement programs at Category III levels, thereby reducing the oversight and bureaucratic burden, and allowing critical Milestone Decision Authority to remain at lower levels within the Command. As a result, some observers have argued that the SOCOM acquisition process is often capable of executing faster (and failing faster), maintaining closer communication between leadership and users, being more nimble, and fostering a culture willing to assume more risk. Can SOCOM Attributes be Replicated by the Military Services? Should Authorities Available to the Military Departments be Extended to SOCOM? SOCOM's acquisition performance is influenced by the size of the organization, focus of its acquisitions (which are limited to special operations-specific goods and services), and smaller size of its programs in terms of both scope of development and dollars. The current SOCOM Acquisition Executive reiterated these points when he reportedly stated that "[SOCOM's] ability to move relatively fast is a function of scale." In recent years, a number of observers have suggested that United States Special Operations Command (SOCOM) is generally more effective at acquisitions than the U.S. military departments, in part because of the perception that SOCOM has unique acquisition authorities.1 This report describes SOCOM's acquisition authorities for unclassified acquisition programs and compares these authorities to those granted to the military departments. It also compares the military departments' and SOCOM's chains of command, and the scope of acquisition activity and program oversight for those organizations. Finally, the report explores whether SOCOM has unique characteristics that influence how it conducts acquisition. SOCOM possesses unique acquisition authorities when compared with other combatant commands.3 SOCOM was established and granted its own acquisition responsibilities in the Fiscal Year (FY) 1987 National Defense Authorization Act (NDAA) (P.L. 99-661). SOCOM was the first combatant command endowed with acquisition authority and its own budget line for training and equipping its forces.4 The FY2016 NDAA (P.L. 114-92) granted limited acquisition authority to the U.S. Cyber Command, making CYBERCOM the second command to have current independent acquisition authority.5 However, SOCOM's acquisition authority is more expansive. ensure the interoperability of equipment and forces. work with the military departments to ensure that the command is appropriately represented in any joint working group or integrated product team regarding acquisition programs for which the command is a customer. These statutory authorities enable SOCOM to manage and oversee its acquisition programs, to negotiate with the military departments for systems to be provided to SOCOM, and to have input into military department acquisitions when SOCOM will be one of the customers of the acquisition program. 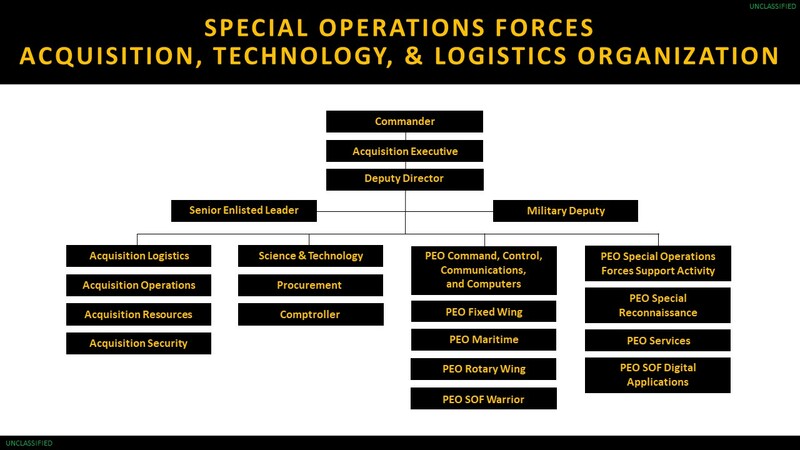 Special Operations Force Acquisition, Technology and Logistics (SOF AT&L) is the organization within SOCOM that leads internal major procurement efforts. The SOCOM Commander is directly responsible for all portions of the command and the Acquisition Executive (AE) reports directly to the Commander. Falling under the AE are the Program Executive Offices (PEOs) and Directorates. This direct chain of command allows for rapid communication on purpose, intent, and decisionmaking (see Figure 1).11 The structure's design is similar to that of the other services, which also follow a Secretary/Commander-AE-PEO-PM structure (see Appendix B). One difference is that in the services, the Service Acquisition Executive reports to the Service Secretary, whereas in SOCOM the AE reports to the Commander. Source: CRS version graphic based on SOCOM website: https://www.socom.mil/SOF-ATL/PublishingImages/OrgChart.jpg. The method SOCOM uses for acquisitions is similar to the acquisition processes used by the military services: they share the same general statutory and regulatory framework; training and education opportunities (i.e., access to Defense Acquisition University and National Defense University); and DOD oversight regime. However, there are also significant differences, many of which relate to the size and scope of SOCOM and its authorities. Table 1 summarizes select similarities and differences. Source: Data based on publicly available acquisition information and on DOD Instruction 5000.02, Operations of the Defense Acquisition System, August 10, 2017.
a. A Major Defense Acquisition Program (MDAP) is a DOD acquisition program that is not a highly sensitive classified program (as determined by the Secretary of Defense) and that is designated by the Secretary of Defense as an MDAP; or in the case of a program that is not for the acquisition of an automated information system (either a product or a service), that is estimated by the Secretary of Defense to require an eventual total expenditure for research, development, test, and evaluation of more than $300 million (based on FY1990 constant dollars) or an eventual total expenditure for procurement, including all planned increments or spirals, of more than $1.8 billion (based on FY1990 constant dollars). b. A Major System is a program where the total expenditures for research, development, test, and evaluation for the system are estimated to be more than $115 million (based on FY1990 constant dollars); or the eventual total expenditure for procurement of the system is estimated to be more than $540 million (based on FY1990 constant dollars). c. Service FY17 actual procurement appropriations (in billions): Air Force—$47.0; Army—$22.4; Navy—$55.8. Derived from Office of the Under Secretary of Defense (Comptroller), PROCUREMENT PROGRAMS (P-1), Department of Defense, February 13, 2018.
d. Department of Defense, ACQUISITION WORKFORCE STRATEGIC PLAN: FY2016 - 2021, Department of Defense, December 2016, p. 12, http://www.hci.mil/docs/DoD_Acq_Workforce_Strat_Plan_FY16_FY21.pdf. Are USSOCOM Authorities Unique? Defense Acquisition of Services (DOD Instruction 5000.74). According to officials, SOCOM has a total of six programs that exceed the category II dollar thresholds.20 Currently, the Silent Knight Radar program, which is developing a SOF-common terrain following/terrain avoidance radar system for use in SOF fixed wing and rotary wing aircraft, is one of SOCOM's largest with a total estimated procurement cost through FY2023 of at $391.7 million.21 FY2017 actual procurement funding budget for the program was $34 million. In comparison, the military services have numerous major programs with significantly higher procurement appropriations. The Navy's 2017 appropriation for the Virginia Class submarine program ($5.39 billion) is 250% larger than SOCOM's entire FY2017 procurement appropriation ($2.08 billion). In FY2017, the SOCOM procurement appropriation was 1.5% of DOD's total procurement appropriation of $132.2 billion. See Table 2 for a comparison of the largest programs in the military services to that of SOCOM. Sources: SOCOM figures from DOD FY2019 Budget Estimates and Service Amounts from Office of the Under Secretary of Defense (Comptroller); Air Force, Army, and Navy figures from Chief Financial Officer February 2018 Program Acquisition Cost by Weapons System. Despite these perceived organizational advantages, SOCOM has experienced challenges in executing its acquisition programs. The Advanced SEAL Delivery System Program, intended to develop a covert submersible insertion vehicle, was documented by both the Government Accountability Office and RAND as experiencing considerable cost, schedule, and performance issues before finally being cancelled in 2009.35 This program illustrates observers' argument that it is not only the ability to succeed faster, but also to fail faster and adapt requirements or acquisition strategies faster, that gives SOCOM the ability to execute acquisitions more efficiently and effectively. The services, on the other hand, have a much broader acquisition mandate, including the acquisition of business systems, weapon procurement programs that must be integrated into joint operations, extensive logistic contracts, large- and small-scale platforms, and substantially more complex systems with multiple technologies and capabilities. This broader acquisition portfolio requires the services to manage acquisition programs across domains, using multiple acquisition processes, and to use different acquisition competencies. To what extent do current acquisition-related laws and regulations promote or inhibit a more efficient, less bureaucratic, and more balanced approach to risk in acquisitions? Based on the DOD report on acquisition authorities required in the 2018 NDAA, should additional acquisition authorities should be granted to SOCOM? Should the definition of military departments as they relate to acquisitions be modified to include SOCOM? Source: CRS analysis of DOD Instruction 5000.02, Operation of the Defense Acquisition System, 2015, amended to incorporate statutory changes based on enacted legislation since issuance of the instruction. a. The Special Interest designation is typically based on one or more of the following factors: technological complexity; congressional interest; a large commitment of resources; or the program is critical to the achievement of a capability or set of capabilities, part of a system of systems, or a joint program. Programs that already meet the MDAP threshold cannot be designated as Special Interest. Source: CRS version graphic based on SAF/AQ websites: http://ww3.safaq.hq.af.mil/Organizations/ and http://ww3.safaq.hq.af.mil/Portals/63/documents/organizations/Air%20Force%20Acquisition%20Organizations.pdf?ver=2018-01-04-141543-547. Source: CRS version graphic based on ASA (ALT) website: https://www.army.mil/e2/c/downloads/502980.pdf. Source: CRS version graphic based on ASN (RDA) website: http://www.secnav.navy.mil/rda/Pages/ASNRDAOrgChart.aspx. Alex Haber and Jeff Jeffress, "Supporting the fight for more effectiveness in DoD Acquisitions," The Hill, March 12, 2015, http://thehill.com/blogs/congress-blog/homeland-security/235393-supporting-the-fight-for-more-effectiveness-in-dod; Special Operations Forces, AT&L, website, http://www.socom.mil/acquisition-authority, downloaded April 17, 2018; Courtney Hacker, We wanted to know SOCOM's top priorities, so we asked the guys in charge, Bloomberg Government, March 2, 2016, https://about.bgov.com/blog/we-wanted-to-know-socoms-top-priorities-so-we-asked-the-guys-in-charge/. Functional combatant commands operate worldwide across geographic boundaries and provide unique capabilities to geographic combatant commands and the services while Geographic commands operate in clearly delineated areas of operation and have a distinctive regional military focus. See also CRS In Focus IF10542, Defense Primer: Commanding U.S. Military Operations, by [author name scrubbed], Defense Primer: Commanding U.S. Military Operations, by [author name scrubbed]. In the FY2004 NDAA (P.L. 108-136, §848), Congress granted the Secretary of the Defense the ability to delegate limited acquisition authority to the Commander of United States Joint Forces Command for a period of three years. This authority was extended, and ultimately expired September 30, 2010. Congress modified 10 U.S.C. 167 to include a major force program (MFP) category for special operations forces. An MFP is "an aggregation of program elements [PE] that reflects a force or support mission of DOD and contains the resources necessary to achieve an objective or plan." MFP-11provides appropriated funds to SOCOM to procure SOF-peculiar equipment and services required to meet its requirements. As such, Congress sets the procurement budget for SOCOM and SOCOM is not dependent on the military departments for procurement funding. The definition for MFP can be found at https://www.dau.mil/glossary/pages/2192.aspx. For more information on MFPs and PEs, see CRS In Focus IF10831, Defense Primer: Future Years Defense Program (FYDP), by [author name scrubbed] and [author name scrubbed], Defense Primer: Future Years Defense Program (FYDP), by [author name scrubbed] and [author name scrubbed]. CRS is unable to confirm the extent to which CYBERCOM will have an independent budget line for train and equip. In the FY2004 NDAA (P.L. 108-136, §848), Congress granted the Secretary of the Defense the ability to delegate limited acquisition authority to the Commander of United States Joint Forces Command for a period of three years. This authority was extended, and ultimately expired September 30, 2010. Per Department of Defense Directive 5100.03, DCMO, Support of the Headquarters of Combatant and Subordinate Unified Commands, special operations-peculiar is defined as: Equipment, material, supplies, and services required for special operations missions for which there is no Service-common requirement. These are limited to items and services initially designed for, or used by, special operations forces until adopted for Service-common use by one or more Military Service; modifications approved by the Commander, SOCOM, for application to standard items and services used by the Military Services; and items and services approved by the Commander, SOCOM, as critically urgent for the immediate accomplishment of a special operations mission. U.S. Government Accountability Office, Special Operations Forces Opportunities Exist to Improve Transparency of Funding and Assess Potential to Lessen Some Deployments, GAO-15-571, July 16, 2015, pp. 17-18. Section 1211(b) of the FY 1988 and 1989 NDAA (P.L. 100-180) directed the Secretary of Defense to "provide sufficient resources for the commander of the unified combatant command for special forces...to carry out his duties and responsibilities, including particularly his duties and responsibilities relating to the following functions: (1) Developing and acquiring special operations-peculiar equipment and acquiring special operations-peculiar material, supplies, and services" (emphasis added). This position was established by the 2008 NDAA (P.L. 110-181). "An Interview with the Special Operations Forces Acquisition Executive James Geurts," Armor and Mobility Magazine, May 2014. Based on CRS conversations with senior SOCOM acquisition officials and the SOCOM Acquisition Executive, June 7, 2018. Vivienne Machi, "Q&A with SOCOM's New Acquisition Executive, James Smith," National Defense, February 8, 2018, http://www.nationaldefensemagazine.org/articles/2018/2/8/interview-with-socoms-new-acquisition-executive-james-smith. DOD has the authority to shift funds from one budget account to another in response to operational needs. For DOD, these transfers (sometimes colloquially called reprogrammings), are statutorily authorized by 10 U.S.C §2214 (Transfer of funds: procedure and limitations), which allows the Secretary of Defense to reallocate funds for higher priority items, based on unforeseen military requirements, after receiving written approval from the congressional defense committees. Specific authorities, such as the special transfer authority established by the FY2017 NDAA, or other limits to transfer or reprogramming authorities have also been added to these general authorities through provisions in annual defense authorization and appropriation acts. U.S. Congress, House Committee on Armed Services, National Defense Authorization Act for Fiscal Year 2018 , Conference Report to Accompany H.R. 2810, 115th Cong., 1st sess., November 2017, H.Rept. 115-404 (Washington: GPO, 2017). DCAA Website: http://www.dcaa.mil/home/dfars (accessed May 4, 2018). US Special Operations Command Directive 70-1 provided by email on August 15, 2017. Acquisition programs generally fall into one of two types: Major Defense Acquisition Programs (MDAP) and Major Systems (MS). See table notes a and b to Table 1 for additional discussions of the statutory requirements for an acquisition program to be designated an MDAP or an MS.
Department of Defense, Department of Defense Fiscal Year (FY) 2019 Budget Estimates: United States Special Operations Command, February 2018, p. 7, http://comptroller.defense.gov/Portals/45/Documents/defbudget/fy2019/budget_justification/pdfs/02_Procurement/14_USSOCOM_FY19%20PB_%200300_PROC_J-Book.pdf. GAO Report 17-332 Defense Acquisition Workforce, pg. 9. Eric L. Mikkelson, "Is SORDAC'S Rapid Acquisition Process Best Prepared to Field Solutions for Future Technological Challenges?" (Master's Thesis, Air University, 2016), p. 6. This point was reiterated to CRS by a number of current and former SOCOM officials in meetings spanning May-June, 2018. Devra Gartenstein, "Advantages Small Companies Have Over Large Companies," Chron, April 5, 2018, http://smallbusiness.chron.com/advantages-small-companies-over-large-companies-23667.html. (accessed May 4, 2018). Jack Preston, Virgin, July 1, 2014, https://www.virgin.com/entrepreneur/start-ups-join-richard-branson-30-year-brainstorm. Michael Mazzeo, Paul Oyer, and Scott Schaeffer, "What small businesses do better than corporate America," Fortune, June 10, 2014, http://fortune.com/2014/06/10/what-small-businesses-do-better-than-corporate-america/ , (accessed on May 7, 2018); Larry Alton, "5 Competitive Advantages Startups Have Over Big Business," Entrepreneur, June 17, 2015, https://www.entrepreneur.com/article/247412, (accessed May 7, 2018). U.S. Congress, Senate Committee on Armed Services, National Defense Authorization Act for Fiscal Year 2004, Report to Accompany S. 1050, 108th Cong., 1st sess., May 13, 2003, S.Rept. 108-46, pp. 342-343. Interview with SOCOM leadership, 7 June 2018, and with former acquisition officials, May-June 2018. James "Hondo" Geurts reportedly stated "SOF acquisitions are accomplished in 1/10th the time, 1/10th the cost, 1/20th the people." James "Hondo" Geurts, "Special Operations Research, Development, & Acquisition Center (SORDAC) AFCEA 2014 Brief", 15. In another instance, Mr. Geurts reportedly stated "Velocity is my combat advantage. Iteration speed is what I'm after. Because if I can go five times faster than you, I can fail four times and still beat you to the target." See Andrew Clevenger, "SOCOM Acquisition Chief Embraces Change, Adaptability," DefenseNews, January 19, 2016, https://www.defensenews.com/industry/2016/01/20/socom-acquisition-chief-embraces-change-adaptability/. ... because of the relatively small size of SOF, most of our programs fall into the lowest Acquisition Category (ACAT). They require less oversight. We tailor our approach to these programs appropriately. The services are doing the same now but they're also responsible for large scale programs that are mandated to have greater oversight. That oversight comes with a cost and schedule impact. CRS Report R41293, The Nunn-McCurdy Act: Background, Analysis, and Issues for Congress, by [author name scrubbed] and [author name scrubbed]. CRS Report RS20643, Navy Ford (CVN-78) Class Aircraft Carrier Program: Background and Issues for Congress, by [author name scrubbed]. Alex Haber and Jeff Jeffress, "Supporting the fight for more effectiveness in DoD acquisitions," The Hill, March 12, 2015, http://thehill.com/blogs/congress-blog/homeland-security/235393-supporting-the-fight-for-more-effectiveness-in-dod (accessed on May 4, 2018). U.S. Government Accountability Office, Defense Acquisition: Advanced SEAL Delivery System Program Needs Increased Oversight, GAO-03-442, March 2003, pp. 8-10. Arena, Mark V., John Birkler, Malcolm MacKinnon, and Denis Rushworth, Advanced SEAL Delivery System: Perspectives and Options. Santa Monica, CA: RAND Corporation, 2001. https://www.rand.org/pubs/documented_briefings/DB352.html.